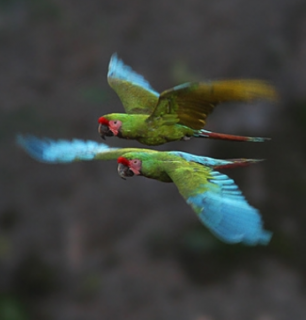 The Military Macaw (Ara militaris) is at risk for extinction in the wild due to habitat loss and the wild bird trade. Progress and outcomes: WPT began funding the study 'Ecology and Conservation of the Military Macaw (Ara militaris)' in 2002. The project aimed to survey population numbers along the Jalisco coast of Mexico, study reproductive ecology and food use, and implement outreach programs in local communities. Research by other individuals/groups have determined that the species' population status and ecological requirements need assessment, as well as closely monitoring the largest known populations. Focus of future work: WPT is supporting a project in the Boca de Tomatlán - El Tuito-Yelapa ecological corridor, along the Jalisco coast, in Mexico. Its primary objectives are to outline the priority nesting areas within the corridor, implement a survey and nest monitoring program, identify and establish contact with property owners of the areas containing nesting trees and roosting sites, design and implement environmental and educational programs for property owners in the nesting area, develop a census of nests in the region and determine the availability of nesting cavities in the study area. Where found: A.m. militaris: Tropics of Colombia and NW Venezuela, south to the E Ecuador and Urubamba region, SE Peru; rarely to Pacific slope of Andes in Peru. A.m. mexicana: Pacific slope in Mexico from Sonora south to Jalisco. A.m. boliviana: East slope of Andes in Bolivia, south from Beni, also NW Argentina in Jujuy and Salta. A.m. mexicana: Pacific slope in Mexico from S Sonora south to Jalisco, formerly to W Chiapas and Atlantic slope from E Nuevo Leon to San Luis Potosi. History: The Military Macaw's range is large, from Mexico to Argentina, but is heavily fragmented. It is gone from many areas, especially in Mexico, and is only local elsewhere (Howell and Webb 1995a, K. Renton in litt. 2007). In Argentina the only records since 1991 are of approximately 50 individuals and in Bolivia a total of 37 individuals in 8 of 21 known locations (L. Rivera in litt. 2012). Populations in Mexico, Venezuela and Colombia face continuing threats, and further losses are expected. Ecology: Military Macaws are found in foothills of mountainous areas in wooded country with valleys to 2000m (6560 ft) and also found at sea-level in Pacific Mexico and Colombia. In Mexico they are seen in mostly secluded uplands in dry woodland, and occasionally in lowland humid and riparian forests. In the Colombian Andes they are found in humid forest, and in Venezuela in rainforest to 600m (1968 ft). Birds feed on variety of fruits, nuts, and are mostly found in pairs or small flocks of up to 10, with roosts in greater numbers on cliff faces or large trees.